It’s that time of the week again! 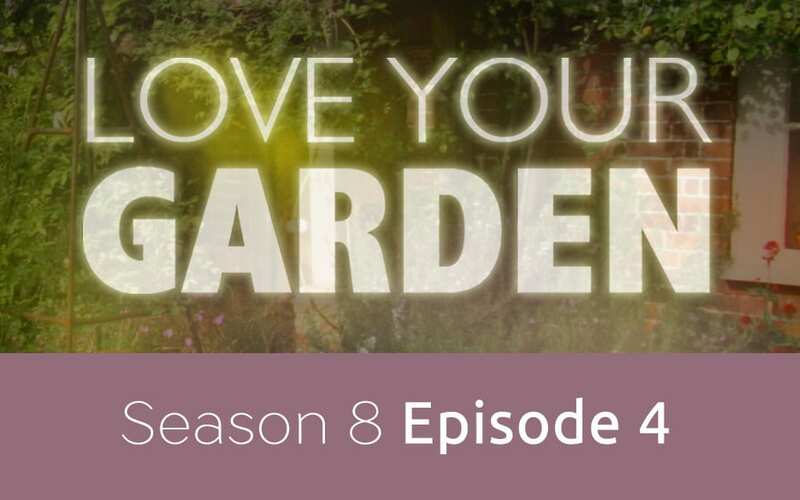 Season 8 episode 5 of ITV1’s Love Your Garden has just finished, so let’s take a closer look at the plants used to create the garden in this episode. If you want vibrant summer-long flowers, then Coreopsis ‘Golden Sphere’ is the plant for you. It’s beautiful double pom-pom blooms appear with a flourish in June and will keep appearing right through to the end of October. 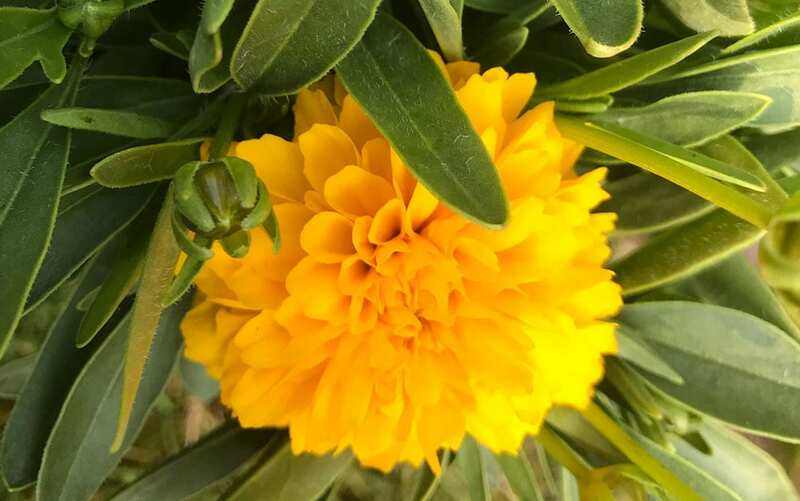 You can get all sorts of varieties of Coreopsis, but ‘Golden Sphere’ is a compact perennial growing to around 45cm square. It’s fantastic for brightening up the front of sunny beds and borders, just make sure it has adequate drainage by putting a layer of grit in the bottom of the hole before you plant. Loved by humans as well as pollinators, this plant is a great food source for bees and butterflies. 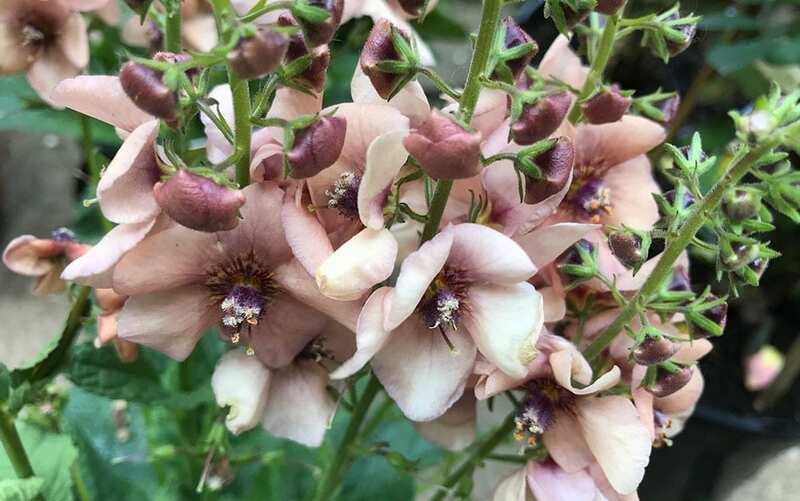 Next up, this incredible variety of Verbascum produces rosette blossoms in such an unusual colour, I can barely define it. Somewhere in the middle between peach, purple and pink, these unique flowers have an intriguing dark eye at their centre. The plant’s silvery foliage is also something to write home about and, being semi-evergreen, is present on the plant for the vast majority of the year. Another one for well-drained soil, apply the grit trick here, too. Plant in full sun and chalky soils for best results – you can always pop this one in a pot on the patio if your garden soil is too acidic. 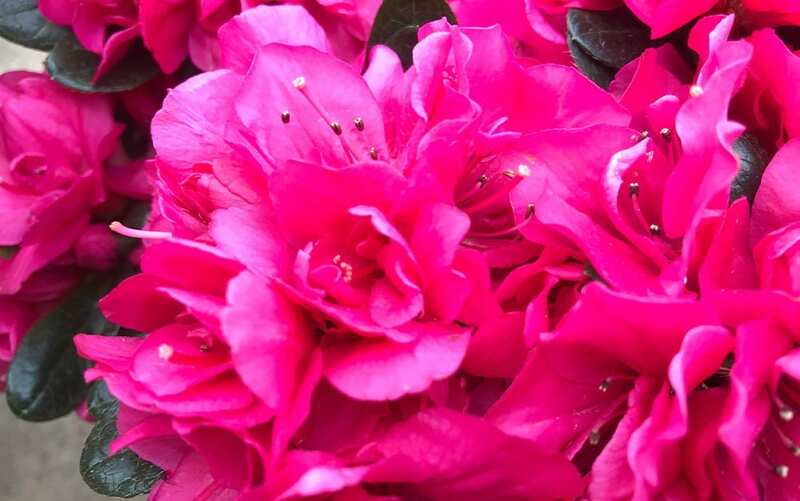 At the other end of the spectrum is the acid-loving evergreen Azalea ‘George Arends.’ As spectacularly bright as some of the Queen’s outfits, its deep pink springtime flowers are quite simply to die for. 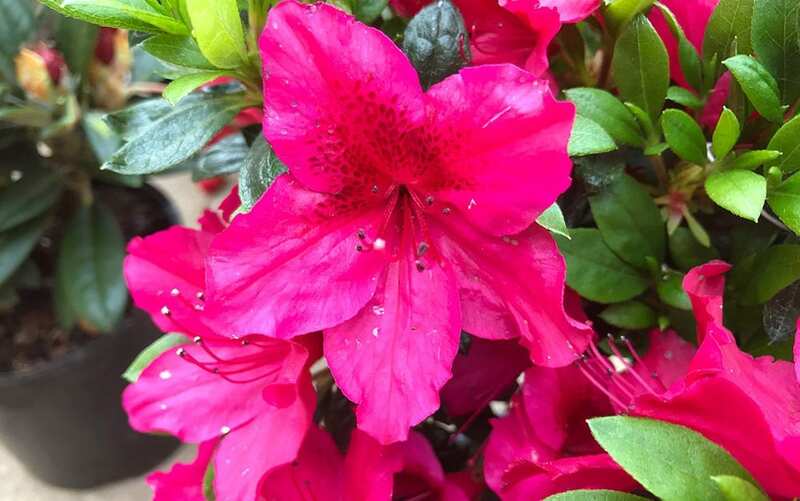 Ericaceous Azaleas are often best kept in containers where it is easier to keep soil acidic. Use an ericaceous compost and avoid watering with straight tap water since it is slightly alkaline and will slowly change the pH of the soil for the worse. 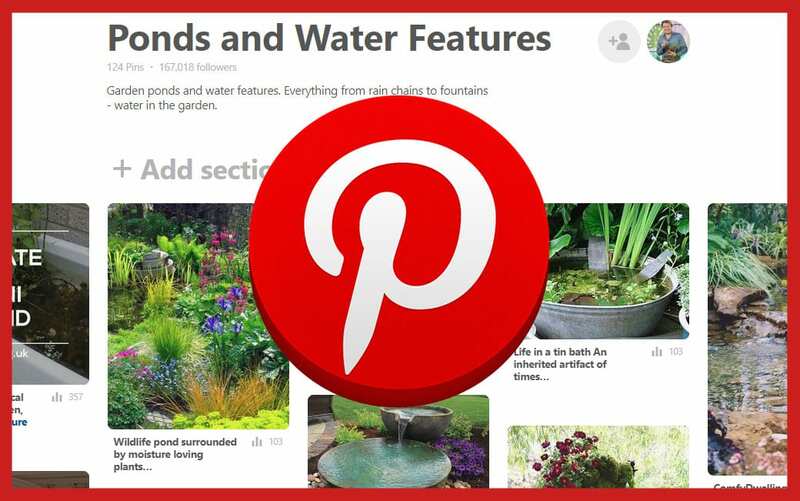 Instead, use rainwater, cooled boiled water, or add sequestrene of iron to your watering can. This plant is fantastic for brightening up shady corners of the garden. A close relative of Azalea ‘George Arends,’ Rhododendron ‘Canzonetta’ also packs a real punch in the looks category. It has a slightly longer flowering period than the Azalea and produces masses of ruffled pink flowers in mid to late spring. It has stand-out deep green foliage which turns bronze in winter, adding extra interest to the garden in the colder months. Like its cousin, ‘Canzonetta’ needs acidic conditions to thrive. 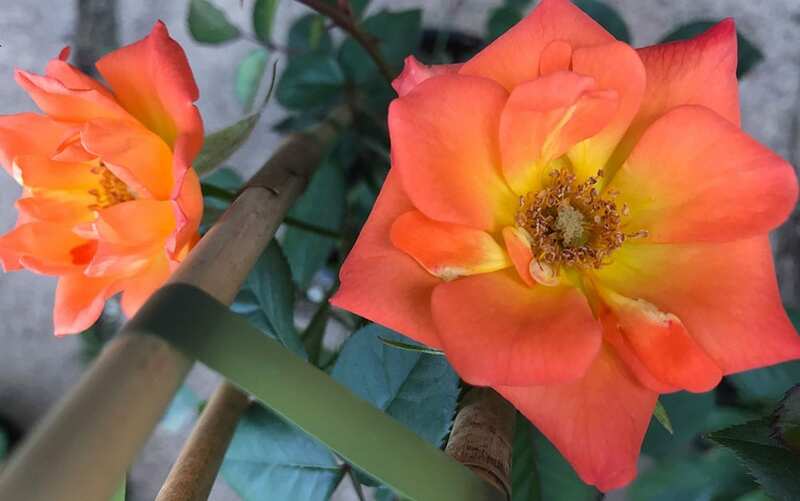 It needs a little more sun than ‘George Arends,’ but will still do well in partial shade. Plant both varieties and you’ll have incredible floral displays in all areas of your garden throughout spring. The exotic white blooms of Zantedeschia aethiopica, with their distinctive funnel shape and yellow tongues, are often more than 25cms in length – that’s just a little shorter than the length of an average garden hand fork! They stand tall on dark glossy green stems and are surrounded by elongated elegant ruffled foliage and make for exceptional border plants, whatever your planting scheme. 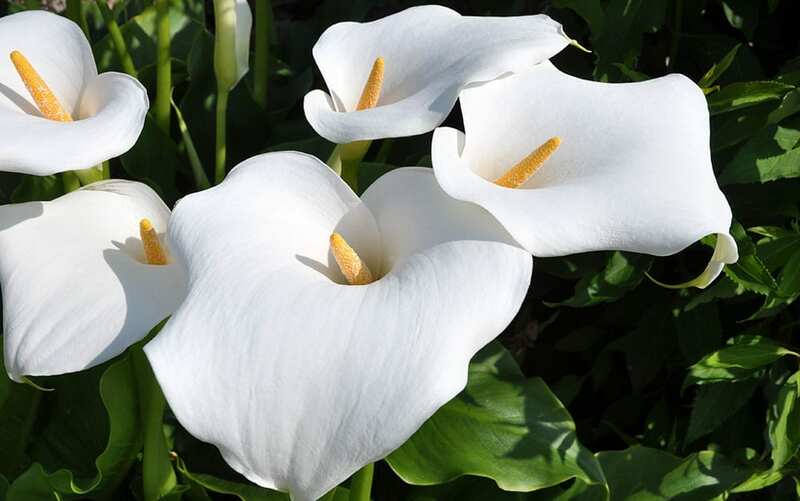 Zantedeschia comes in two broad types: Arum lilies and Calla lilies. 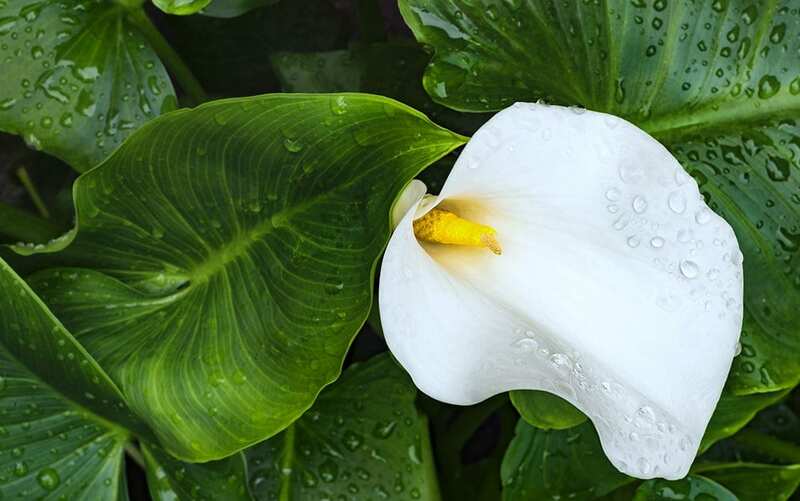 Arum lilies are hardy down to around -10 degrees celsius, meaning that they’ll survive most UK winters, while Calla lilies are frost tender and often require winter protection. Zandeschia aethiopica is an Arum lily, so relatively frost hardy, although it’s best to give it a deep winter mulch to be on the safe side if you live in a frost-prone area. Like other members of the Araceae family, these lilies absolutely love a poorly-drained soil. If your garden soil is well-drained, decrease drainage by lining your planting spot with plastic and punching a few holes in the bottom. Alternatively, plant these lilies as a marginal pond plants or pot them up in a container using aquatic compost and stand them in shallow water. 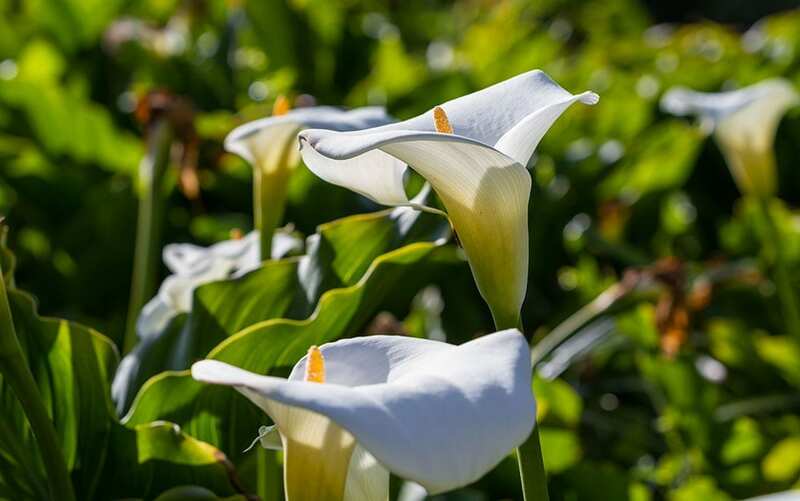 Zantedeschia lilies can sometimes suffer with aphids, but spraying a garlic and white wine vinegar solution onto stems and foliage will help to protect them from these pests. The beautiful sunrise colours of this miniature variety certainly give the ‘Warm Welcome’ that it’s name promises. 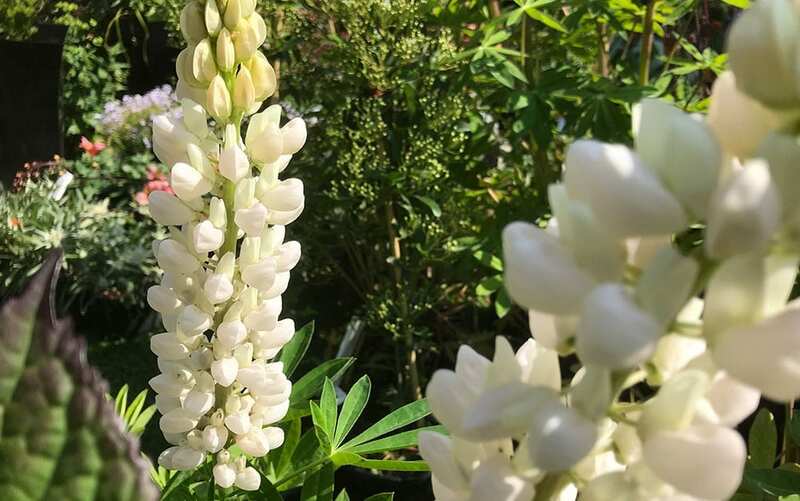 Very much on trend this year, Lupins are a fantastic way to create a soft cottage garden feel in your borders. 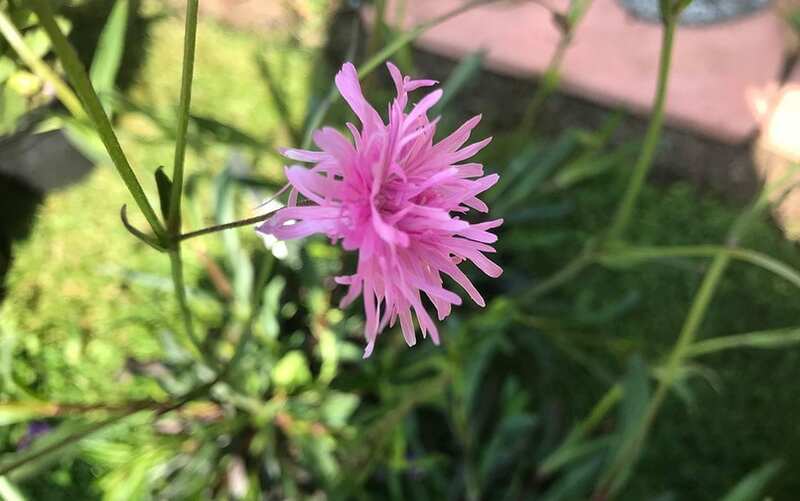 This hot pink spiky flower may be small, but it certainly punches above its weight in the looks department. 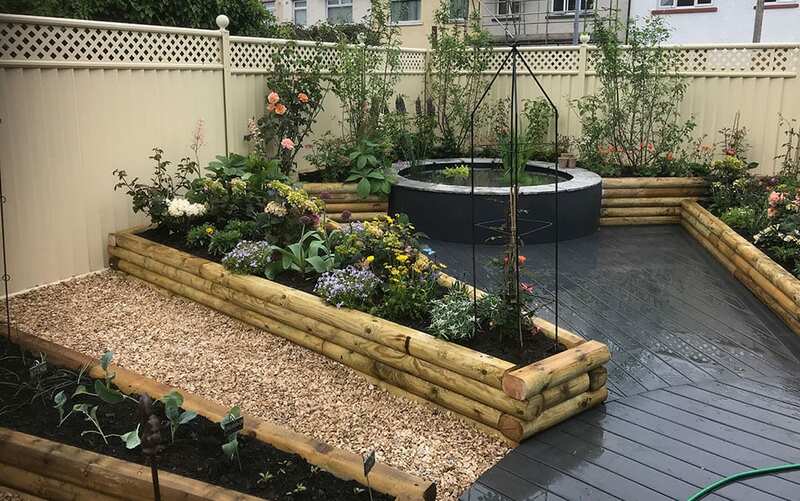 These raised beds not only look delightful, but make gardening less strenuous for the owners. 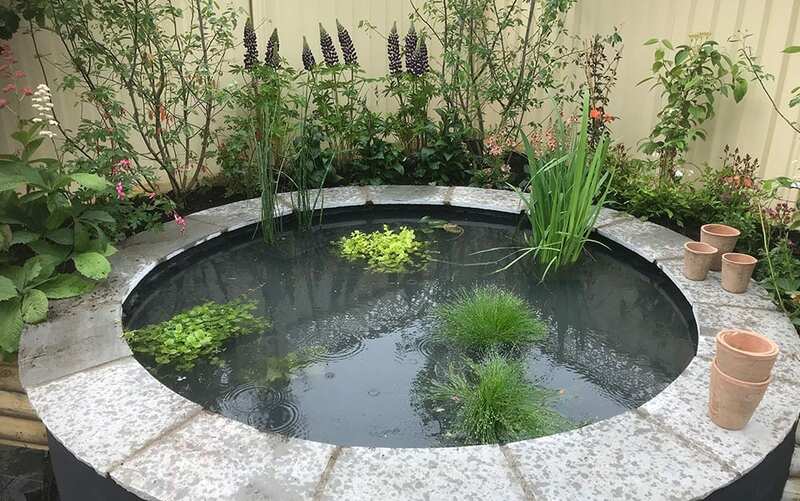 A beautiful raised pond complete with light grey Pavestone natural sandstone edging. 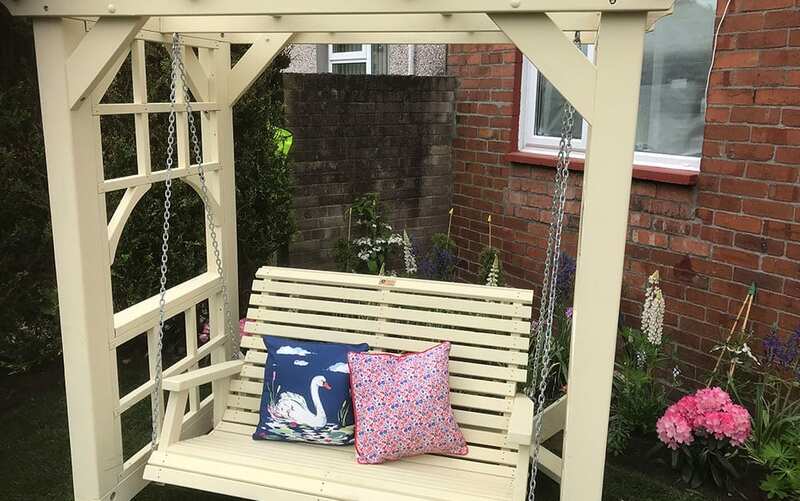 This beautiful swing creates a wonderful spot for enjoying the newly-impressive garden. That concludes my look back at this incredible garden transformation from Love Your Garden season 8 episode 5. Tune in to ITV1 next week at 8pm on Tuesday for the next episode in the series and join me again on my website for more weekly updates on the plants used in that week’s show.